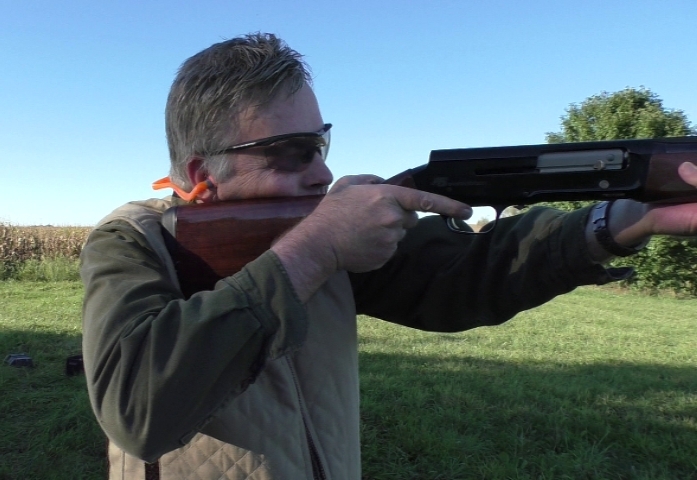 Although as cited in the original review, it is hard to call the new Browning A5 inertia autoloader wondrously perfect out of the box, it does go where no autoloading shotgun has gone before: the sub-six pound 16 gauge. The center bead was quickly plucked out and, although the three supplied Invector-DS choke tubes were not usable for hunting, Browning does already have more Invector-DS choke tubes available. The Improved Modified Invector-DS 16 gauge tube (.646 in. exit diameter) yields a .023 inch constriction in the tested A5, a far better option than the supplied IC and Mod chokes for many applications including wild pheasants. For those looking for comfortable to shoot loads for clays, dove, and so forth Federal has the “Game Shok” H160 load which is a 1 oz. 1165 fps shell in 6, #7-1/2, and #8 shot. The Fiocchi “Game & Target” loads (16GT75, etc.) are very similar loads. For pheasant hunting, high performance buffered loads are hard to find, but Federal offers two of them. One I've used for many years, their P165 1-1/4 oz. 1260 fps load, available only in #4 and # 6 shot. Federal's more recent offering is an PF163 1-1/8 oz. load at a smoking 1425 fps. Normally, I'd look to the more traditional velocity load, but the PF163 is both buffered and available in #5 shot. 1-1/8 oz. of #5 shot nets about 191 pellets, while the 1-1/4 oz. of #4 reaches about 169. In the case of the “Magic of the Sixteen Gauge,” the actual bore difference, in a Browning shotgun, is small vs. a 20 gauge. Browning uses the “backbored” jargon of their 20 gauge Invector Plus and Invector-DS barrels, yielding a bore of .625. The A5 Sweet Sixteen has a bore diameter of .669 inch. The 20 gauge is just a “full choke away,” dimensionally, from being a 16 gauge. What is noticeable with the A5 is the easier shell-handling the 16 gauge provides, and the speed-loading execution of the Sweet Sixteen is superb. The A5 Sweet Sixteen itself is remarkable in that it is by far the lightest Browning repeating shotgun ever made, shaving more than ½ pound away from the 6-1/2 pound Browning Silver and Winchester SX3 20 gauges. The A5 Sweet Sixteen trigger remains far too heavy, breaking at a heavier weight than the entire gun. The trigger guard will go to Jim at Cole Gunsmithing, for a more appropriate 4 – 4-1/2 break weight. As time is growing short, it may have to wait until after pheasant opener. If you want a strong wild pheasant load, the Federal PF163 1-1/8 oz. buffered load, #5 shot, is currently the best on the market, and when paired with the Invector-DS Improved Modified tube, will satisfy most wild pheasant aficianados. For Browning trigger trouble, Cole Gunsmithing is the solution. "They can certainly be improved over what the factory sends them out with. Turn around is typically two weeks or less. Cost is $95."